Orlando’s got Disney’s Magic Kingdom and the Magic NBA team, and this past weekend Orlando had makers doing their own magic at a two-day Maker Faire at the Orlando Science Center. 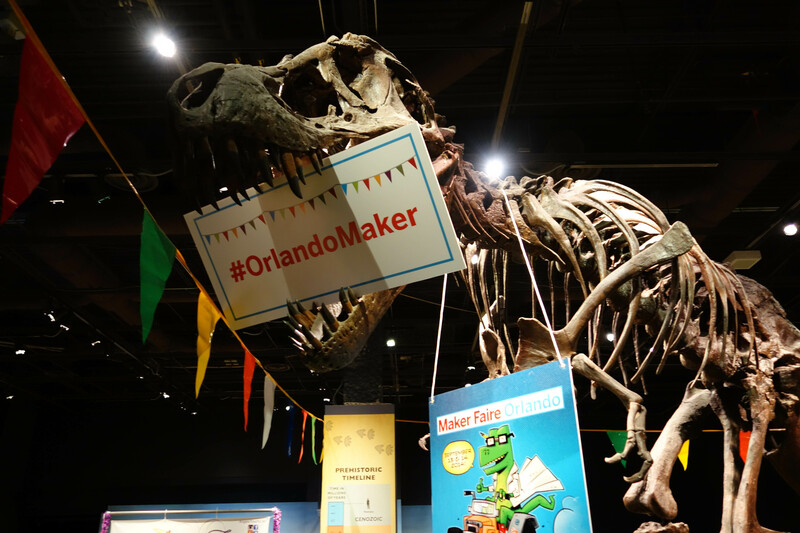 A collaboration between the science center and the community-based Maker Effect Foundation, the Orlando Maker Faire is the first full Maker Faire in Florida. Special thanks to key organizers, Ian and Candy Cole and the event producer, Jessica King. Judging from the turnout I saw on Saturday, there were many who were excited to meet all the makers and engage in a wide range of making activities. I was happy to participate in a morning session before a group of educators. I talked about the importance of making as way to foster curiosity and creativity. I was joined by Mark Greenlaw of FIRST, who interviewed three teen-aged members of FIRST. One young woman was a member of “Exploding Bacon”, a name she explained that was obtained from a random name generator. A Florida native, Jay Silver of Joy Labz also gave a wonderful talk, sharing his thoughts as he begins the process of creating what comes after MaKey MaKey. Jay showed short videos of the patterns of water reflecting off the underside of a tree, whose leaves were also moving in the wind. He said his young son discovered that flying gnats responded to the sound of his voice, and they hooked up a speaker to see the gnats flying in a pattern set by sound waves. Jonathan Thompson, middle school band teacher, exhibited two rolling ball sculptures, one of which was had the ball rolling thru an eerie skull. Orlando Maker Faire was the first time he had exhibited his work in public and he said he was working furiously all week to get it ready. See more of Jonthan’s work on YouTube. Here are some of the makers I enjoyed meeting. Marianne Kirby (@TheRotund) exhibited a homemade printing press that used a car jack to apply pressure. Her prints were colorful and distinctive. Neil Jansen, a self-styled visionary punk from Melbourne, was demonstrating an early version of FirePick Delta, a Delta 3D printer that can be setup as an inexpensive pick-and-place machine. Neil believes the FirePick is a lightweight manufacturing system with many uses. He expects to be delivering several beta units very soon. Pierre Baillargeon (@kabong), a robotics engineer in Palm Beach, is a leader of Palm Beach LED (Laboratory of Experimentation and Design), which emphasizes “learning-through-doing in a social environment.” With the South Florida Science Center and Aquarium, they organized a Maker Camp this summer. Pierre also told me about the South Florida Makers Union (nice logo and T-shirt). The Makers Union is a network of various makerspaces in South Florida — and may drop the South eventually. It’s a good sign that makerspaces want to communicate with each other and collaborate. In addition to a local community lab and makerspace called FamiLab, I saw groups from Melbourne Makerspace and Tampa Hackerspace. I talked to members of the Orlando Robotics and Makers Club, which meets monthly downtown in the library. Emma is a young woman showing people how to make soap that could be mixed-in with funny shapes. Rebecca Rose, a jeweler, talked about the process she uses to make her rather fascinating Sculpture Rings and showed a variety of samples. Outside on the deck, there were a variety of solar cooking ovens — and it was a pretty sunny day. Also, Bob Bennett was demonstrating his RaspberryPi-based system for rotating and adjusting a telescope and photographing what it sees. His open source project is called OpenGimbal.net. My understanding is that you can point it at a part of the sky and it will begin taking pictures of the brightest objects it sees, and then stitch those photos together into a larger photograph. Michael and Melody Ingrassia of SteamLabs demonstrated a variety of educational kits and projects that they use at summer camps, including an odd looking Arduino-controlled monster in a box. Michael also developed his own poster for Maker Faire and Melody, who is a puppeteer, also display several puppet projects involving conductive thread and LEDs. Wesley Faler (iondragonfly) recently moved to Florida from Detroit. He was showing his work on SmallSat experiments. Christine and Shydonna are the enthusisatic founders of a 30-student school known as Ampers&nd, which they say is a maker school in Longwood FL. There were a good number of 3D printers in action. Orlando’s own DeltaMaker had several of their models on display. I was impressed by the makers I met in Orlando and the growth of the maker movement throughout Florida. The Orlando Maker Faire is a great example of a community-based group that started a Mini Maker Faire, which is to say they started small, and now they have found a great partner in the Orlando Science Center to help grow the event and introduce more people, young and old, to the magic of making. Marianne Kirby shares a print from her homemade printing press. Justin is the graphic artist who designed the poster for Orlando Maker Faire. The T-Rex greeted guests of Maker Faire Orlando. Rebecca Rose makes Sculpture Rings. Bob Barnett was talking about his open source project, OpenGimbal.net. These telescope mounts use RaspberryPI to control motion. This solar cooker was on the deck cooking onions. Makey was just hanging out. Michael Ingrassia holds an educational robot he designed. Melody’s puppets are designed for summer camps and include interactive elements. A small stage for robot wars but it was very popular. A view from an upper floor looking out on inside exhibits. Richard, Joseph and Jim from the Orlando Robotics and Maker Club, which meets monthly at the library downtown. Melbourne Makerspace had a booth. The lockingpicking demonstration was popular. The En-able group exhibit got everyone talking about robotic hands. Wes Faler is developing small form-factor satellites (small Sat). Christine and Shydonna are founders of Ampers&nd School in Longwood, FL. Adults and children were opening up computers and other electronic equipment.